Principal Automobile Routes In and Out of Los Angeles. 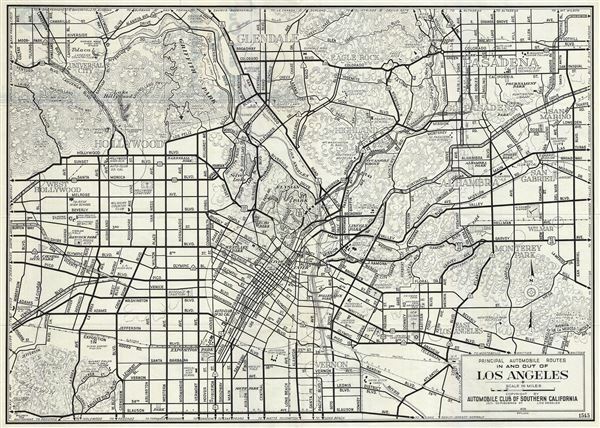 This is a fine 1946 map of the city of Los Angeles, California issued by the Automobile Club of Southern California. The map details the various routes in and out of Los Angeles and covers from Baldwin Hills north as far as Grand Central Airport. It notes major streets, parks, highways, individual buildings, and a host of additional topographic features. Copyrighted and issued by the Automobile Club of Southern California, Los Angeles.